I return to the Cafe De La Grave year after year because the owners have taken a rather ordinary building and created magic on the inside. They've done this without great expense. There are no slick draperies or fancy seating. The tables are wood and many of them have been painted by local artists. The walls are lined with rough old boards, planked horizontally and adorned with curious works of art by local Quebecois artists. On another wall are shelves, containing books I'll never read...it doesn't matter. They've created an aesthetic that appeals to me, and apparently many others. 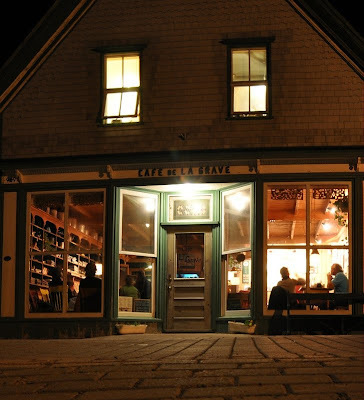 Cafe De La Grave is busy like no place that I've ever seen in my home province of Nouveau Brunswick. Why? I see a number of reasons. First and foremost is the atmosphere. They've created a landscape within the walls. When you walk through the doors you're immediately taken away from wherever you've come. It's escapism. our troubles melt away. The menu is small but thoughtful. Last evening I dined on a smoked mackerel bagel with side salad and frites maison. It's worth tearing apart my meal for the sake of investigative gastronomy. The bagel was not one of those horrible puffy dough pucks that we find at the Superstore. Neither was it poisoned by the hand of the Pillsbury Doughboy. The smoked mackerel was caught in the waters off this archipelago, and smoked to perfection. It was schooled with cream cheese, capers, tomatoes, onion and fresh sprouts. Adorning the plate was a simple side salad of leafy greens, cucumbers, shredded carrots, radish, onion and sprouts. To turn the bagel into a meal, it was joined by frites maison and mayo. The fries were authentic, neither SuperFried nor TastyTatered. I could live on them alone. It was cold outside last evening, so the warmth of the cafe felt particularly embracing. It was like stepping into your favourite wool sweater. The sandy warm lighting dropped from the ceiling to each individual table, casting an intimate glow. Animated conversation emanated from every table. The French, socially, are exuberant. As a boring Englishman, I watch with regret, but we are who we are. Earlier in the evening I had spotted the proprietor of the cafe. I believe she was the niece of one of the original owners. She was a pleasant girl with a pretty complexion, dark hair pulled back to a short pony tail. She moved easily throughout the cafe, greeting her regular customers with European embraces. When she played she moved rhythmically with the tides...gently back and forth. She was transformed by the instrument, like the girl next door who shed her glasses and permitted her hair to fall upon her shoulders. The sound of the accordion filled the room with warm shiraz, and I was happily swimming in it. Can you think of a place in your little world that combines atmosphere, great food, music and art? But wait! I don't have to drive to les Iles De La Madeleine to find all that...I get that at home. It's opera and guitar instead of accordion, and the frites maison are plain old spuds, and I have to wash my own dishes, and the ceiling in my living room is atrocious. But all of that can change. This winter I'm going to renovate my home. I'm also going to renovate my wife's home, if she'll let me. It'll become the Cafe Des Vartistes, and you're all invited! Neither can we - can't wait to see the menu, listen to the music, view the art and drink it all in. What a wonderful review for Cafe de la Grave! Could NYC Ever Be As Beautiful As A Jemseg Swamp?